A re-elected Turnbull Coalition Government will partner with the NSW Baird Government in a City Deal for Western Sydney. Unveiling the partnership Mr Turnbull said Western Sydney City Deal was the single largest planning, investment and delivery partnership in Australian history. It addresses the two critical challenges for Western Sydney - stimulating job growth and better transport links between the region and the rest of Sydney. The Cities Deal will be centred around Western Sydney Airport – the most significant piece of infrastructure that will ever be built in the region - and passenger rail that will link people to the jobs created around the airport. The new airport alone will create 39,000 new jobs over the next 20 years, but the government aims to do much better. "We aim to catalyse the additional 178,000 new homes and almost 200,000 new jobs that will be required to support the population directly around the airport - which is projected to reach over 1.4 million over this period," he said. "We will leverage our investments in the airport, planned rail link and key transport infrastructure to make the land use changes and create investment incentives to achieve these ambitious housing and employment targets. "The City Deal for Western Sydney will draw on a new investment fund announced to accelerate clean energy, renewable energy and energy efficiency technology in cities through the Clean Energy Finance Corporation. It will also draw on the $50 million competitive Smart Cities and Suburbs program to support councils apply cutting edge technology solutions to improve services, urban spaces and liveability. Premier Baird said the agreement will be an exemplar of community engagement. 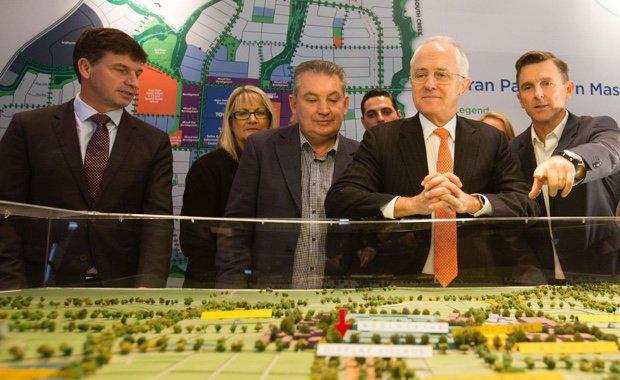 "We welcome this vital initiative by the Turnbull Government for Western Sydney and a commitment to contributing to the funding and delivery of infrastructure to realise the region's potential,” said the Premier. "The development of Western Sydney Airport is the most significant economic development initiative in the country and we welcome the commitment of the Turnbull Government to delivering infrastructure to transform the region. "This opportunity shows the value of governments with the shared goal of providing jobs and growth for Western Sydney working together to make it happen." The City Deal for Western Sydney addresses the disconnect that has existed between commonwealth, state and local governments for NSW's fastest growing region, Stephen Albin, CEO of the Urban Development Institute of Australia (UDIA) NSW said. “Western Sydney is growing exponentially and over the next 10 years this growth will see the area develop to be as large as Adelaide,” Mr Albin said. “We welcome the government’s City Deal announcement and the recognition that the Western Sydney Airport should be the centre-piece of how we build the region. “The Airport will bring together the North West and South West of Sydney to form the largest new population conurbation in Australia. “A City Deal with help critical infrastructure, such as the Western Sydney airport, connect people to housing and jobs.